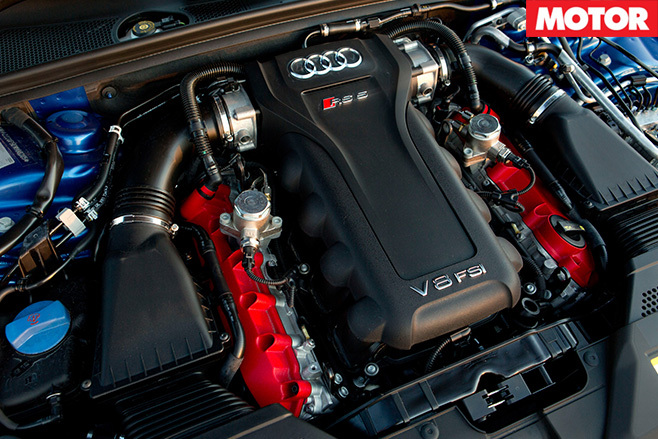 One of the most appealing things about Audi’s RS5 Coupe has always been the rumble and baritone bark of its hand-built 331kW/430Nm 4.2-litre atmo V8. So what better way to pump up the volume on this bent-eight boom box, than to get rid of its noise-muffling roof? Audi’s quattro GmbH performance division has lifted the lid on the RS5, one of three new RS models heading our way in the near future; the others being the RS7 and the RS Q3. The RS5 Cabrio’s electric soft-top, with heated glass window, is claimed to open in 15sec and close in 17 at up to 50km/h. And just in case you’re not in the mood for aural engine entertainment, the roof is lined with an additional 15mm layer of acoustic foam to keep noise down. When folded (under a solid lid), the roof only pinches 60L of the boot’s 380-litre capacity, so the RS5 retains decent cargo space in open-air mode. A split-folding rear seat back further enhances flexibility. In terms of rigidity, Audi claims specific reinforcement components compensate for the absence of a metal roof, including extremely stiff tubes reinforcing the A-pillars, and diagonal struts running from the side sills to the front subframe, with a similar arrangement at the rear. A solid aluminium frame, housing rollover protection, is located between the interior and luggage compartment, and if the system senses a rollover, pre-tensioned springs instantly push up aluminium supports behind the rear head restraints. The weight penalty for the extra metal and systems is 205kg, so the 1920kg Cabrio’s claimed 0-100km/h time of 4.9sec is 0.4sec slower than the Coupe. Specially-pigmented, perforated leather used on the interior minimises sun damage. There’s also optional three-stage, head-level heating for winter, and aluminium front guards help offset the weight of the reinforcements. 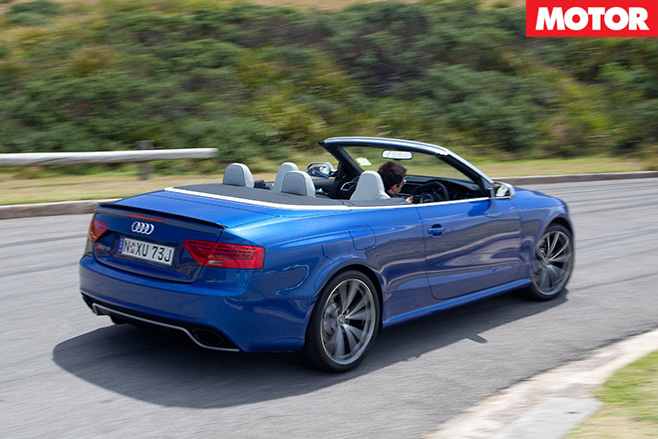 In virtually every other respect, the RS5 Cabrio aligns directly with its hard-top sibling. The seven-speed ‘S tronic’, dual-clutch ’box is standard, as is quattro permanent AWD, with self-locking centre diff and torque vectoring. As expected, the engine and exhaust (especially with sports exhaust option) sound absolutely ballistic with the top down. 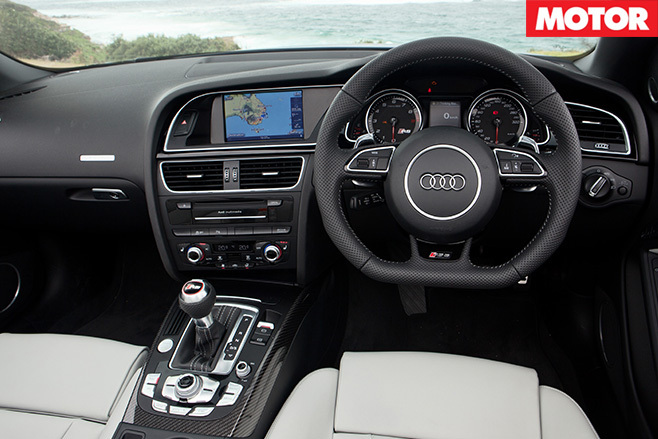 With windows up and the rear wind deflector in place, the interior remains quiet and comfortable, even at 110km/h. But despite all the reinforcement, the body shakes over even mild imperfections. While it’s unrealistic to expect rock-solid rigidity in any soft-top car, there are cabrios costing far less than this car’s $175,900 that are more composed over typically pock-marked Aussie roads.